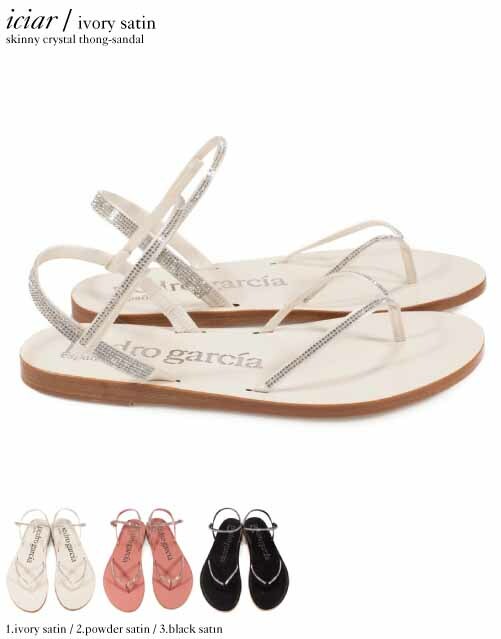 Sandals with clean but confident lines. Defined shapes with platform soles. Delicate silhouettes embellished with crystals. 100% Pedro García. A group in calf, presented exclusively in three shades: ivory, powder, and black, with a lustrous, almost waxy sheen, reminiscent of Bakelite. This resemblance to the finish of the revolutionary, high-tech plastic of vintage telephones, with their solid colors, gives these bold contemporary sandals and their simple yet striking outlines an attitude that’s almost futuristic, the ultramodern mood of the Space Age and Kubrick’s Space Odyssey. The group is a compact one, comprising three styles and one bag. The flat criss-cross sandal, absolute purity in ivory, is followed by a sandal with two bands, mounted on an ingot-shaped wedge, one of this season’s iconic designs. A skinny crystal thong provides a counterpoint, with its delicate satin straps and Swarovski crystals. A folder-style clutch, fastened with a strap and ideal for any occasion, completes the group.